Jack and Shelley Butterworth have been farming at Mamaku for over 30 years with a mix of dairy, deer, bush and pines. 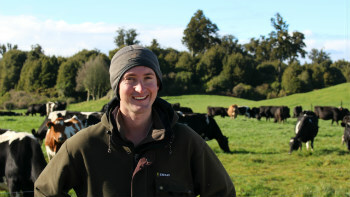 Their son John works as a share-milker, grazing about 550 cows on 200 hectares. In this video John talks about using imported maize to help maintain production and reduce nitrogen leaching. Jack and Shelley Butterworth have been farming at Mamaku for over 30 years with a mix of dairy, deer ,bush and pines. Their son John works as a share-milker, grazing about 550 cows on 200 hectares. Today John talks about using imported maize to help maintain production and reduce nitrogen leaching. We get over two metres of rain each year. When it’s wet we protect our pasture and soil by limiting grazing to four hours a day. Feeding maize also helps us meet our environmental targets. Introducing maize silage allows us to keep milking twice a day right through to the end of May when we get a ‘shoulder season’ premium from Open Country Dairy. The maize is grown by contractors in coastal Bay of Plenty. We agree on the price and quantity in September. It gets delivered and stacked on a concrete pad in late March or April. We inoculate and cover the maize stack so fermentation can get underway. The maize is loaded into a feed-out wagon and placed in concrete bins on the feed pad. There is very little wastage, unlike feeding out on pasture. We add finely ground lime to prevent milk fever. The feed pad has a gently sloping base and was formed by quarrying down a small rhyolite hill (knoll?). We remove the effluent using a scraper on the tractor. In April and May the cows get five kilos of maize dry matter each day. This is fed out just after the morning and afternoon milkings. Once the cows dry off, they get about four kilos in a single session. The cows really thrive on the combination of protein rich pasture and carbohydrate rich maize. The maize kernels are cracked during harvesting so they can be fully digested. The cows stay in good condition which improves calving and mating performance in spring. The maize also lets us extend the winter grazing rotation and build up pasture covers for when the new milking season begins. The whole system is flexible and simple for staff to operate. The main challenge with using imported maize is the price which changes each year. You also have the cost of a feed wagon and pad, staff time and additional effluent. For our farm, these costs are justified by improved cow fertility and milk production, especially the shoulder season premium. The imported maize means we need less urea fertiliser to boost pasture production. This reduces nitrate leaching in two ways. Firstly, there is less nitrogen cycling around the whole farm system. Secondly, maize has a much lower nitrogen content than pasture, leading to less nitrogen in the cow’s urine. This means less nitrogen ends up in the soil which reduces nitrogen leaching. Imported maize has helped us meet our business and environmental targets. It gives us greater flexibility and the cows love it. On the Butterworth’s farm, using imported maize was compared with using additional urea to grow more pasture for similar total milk production. OVERSEER indicates nitrogen leaching decreased by 19 kg per hectare. FARMAX analysis indicates a net cost of $23 per hectare, including equipment costs, at a $6 pay-out plus a share of the shoulder season premium. The maize silage GMP does incur a net cost of about $23/ha – this impact has been reduced somewhat due to the use of a low-cost rhyolite feedpad. DairyNZ provides broad guidance on feeding supplements including specific guidance on maize silage. DairyNZ also provides a supplement price calculator to guide what to pay for supplementary feed. A separate DairyNZ factsheet covers mineral supplementation for maize silage. Pioneer is a major supplier of maize seed and outlines the benefits of maize silage here. This Pioneer webpage also has links to silage stack preparation and management, product information and FAQs. There will be nutrient losses where the maize is grown – ideally this will be in a catchment that is less sensitive to nitrogen loss than where the maize is used. Comparative environmental impacts of intensive all-grass and maize silage-supplemented dairy farm systems: a review. By Williams, Ledgard, Edmeades and Densley, New Zealand Grassland Association (2007). Dairy farming, nitrogen losses and nitrate-sensitive areas. By Ledgard, de Klein, Crush and Thorrold, NZ Society of Animal Production (2000).